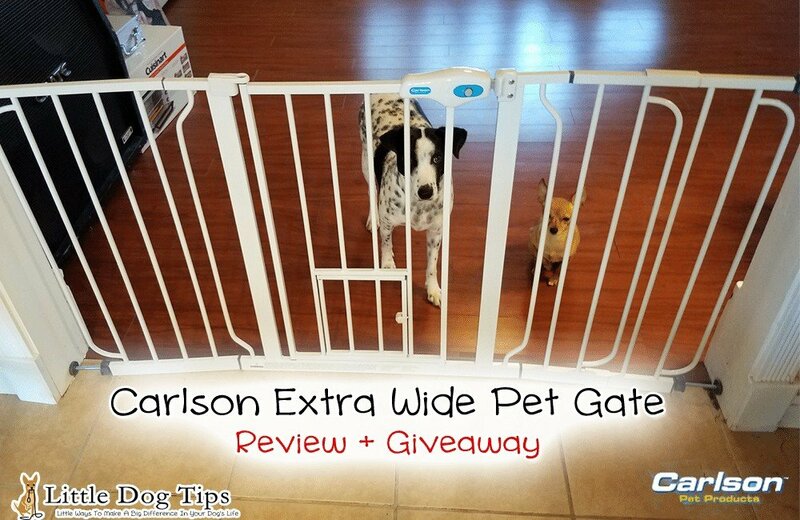 A few weeks ago I reviewed the Design Paw Arched Flexi Gate from Carlson Pet. I was impressed with the wood accents and modern style, but it’s not the perfect fit for every household. I had the opportunity to review yet another of their pet gates. If you’re shopping for a new gate, be sure to check out several models to make sure you’re getting the right height, width and design for your home. A high-quality gate should last for decades, so you’ll want to make the right choice the first time. Disclaimer: I received a pet gate and compensation in exchange for my review, and this post may contain affiliate links. I only feature products that me, Matilda and Cow absolutely love! The Extra Wide Pet Gate fits entryways 29-52″ wide. My opening is actually 60″ wide, so I also received an extension to make it fit. Like the Flexi gate from my last post, this gate has a walk-through door so you can pass through without stepping over the gate. You also won’t have to lift your pet or remove the gate to let them through. I’m still in love with the tiny built-in door. I don’t use it often because I usually allow both dogs through at once. I have found it useful lately as I’ve been teaching the dogs to wait their turn while training them, instead of trying to fumble with training them both at once. This gate is pressure mounted. You don’t have to make any holes in the wall to mount it, though you can screw in the included wall cups for extra security. Like all pressure-mounted gates, a particularly strong or determined dog could push it, but using the wall cups would solve that problem. One major difference between the Flexi gate and this Extra wide gate is the handle latch. To open the Extra Wide gate, you have to push the buttons in the handle and slide the latch back. To close it, just swing the door back into place. The latch easily fits back into the lock without any extra maneuvering. It’s easier to close than the Flexi gate. Unlike the Flexi gate, the Extra Wide gate does require some initial figuring-out. The Flexi gate is simply unfolded and placed, though it’s really meant to be screwed into a wall. I was unfamiliar with this type of pressure mounting system. To install, I had to expand the spindle rods, then tighten the adjustment wheels until the pressure held the gate in place. The gate door will have a gap when you take it out of the package. The pressure closes this gap after mounting so the door will swing and latch into place. It took me no more than 15 minutes to set up this gate by myself. As a clumsy, uncoordinated person, I felt pretty darn proud of myself when I was finished. But it really wasn’t so difficult. It’d be slightly easier to have a partner hold the gate up while you tighten the rods. I’ve been using this gate for a month now, and it still looks new. Cow puts her front paws up on it when she’s happy to see me come home, and her 30-pound heft is not able to knock it down or undo the latch. You have to press a handle button on both sides to open the gate, so a dog cannot learn to open it with their nose or paw. Yes, yes I would! In fact, I’ve worked with Carlson Pet to host a giveaway so you can get your very own. USA only, must be 18 or older to enter. Ends February 3rd 2017. Learn more about Carlson Pet Gates. They’re available for purchase at PetCo! I love Lindsay’s articles on Chihuahuas and have found them invaluable in raising my fur girl. I often share her articles with friends and family through emails and on Facebook. Awww, I’m so glad to hear that Kathy, thank you! We might need some of these when the baby arrives (I’m sure it would help with the puppies too). Although we’ll probably need the narrow sized pet gate as we don’t have any wide openings to block off in our house. 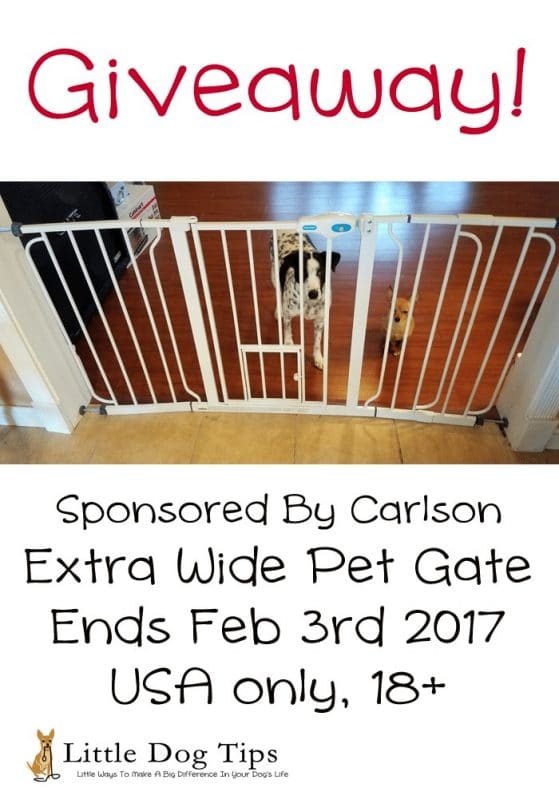 I’ll check the Carlson website to see what other pet gate products they have available. Thanks for sharing! Colby recently posted…My Puppy Goes Crazy Sometimes! What Do I Do?